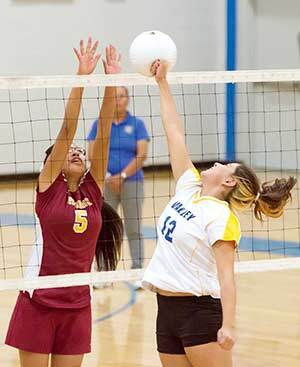 TOP: Sanders Valley sophomore Melosa Padilla (12) punches the ball towards Rough Rock’s Dereka Brown (5) on Monday night in Sanders, Ariz.
BOTTOM: Lady Pirate Shevelle Six put across 11 aces against Rough Rock on Monday in Sanders, Ariz.
Mary Lynch and Apple Decena wanted the same thing on Monday night. As the fourth-year coach for the Rough Rock volleyball team, Decena said his inexperienced club has improved by leaps and bounds since the start of the school year so he was hoping to get their first win of the season. In the end, however, it was Lynch’s team that triumphed with a 22-25, 25-15, 25-9, 25-13 win. “We’ve had a really rough start and that’s because we have a young team,” said Lynch, the second-year Valley coach. “They are still trying to know each other and tonight they did a very good job. I’m real proud of the way they played. They needed to get that first win under their belts." Lynch said some of that youth showed in the opening set, as Valley could not let a 19-15 cushion stick. Instead the Lady Pirates struggled to maintain what little momentum they had as Rough Rock closed out the set on a 10-1 run. In the midst of that stretch, Rough Rock’s Danielle Tsinnijinnie scored the game’s final five points and served across two aces. After trailing 4-2 in the next set, Valley put together an 11-1 rally, which included five consecutive aces by sophomore Shevelle Six. 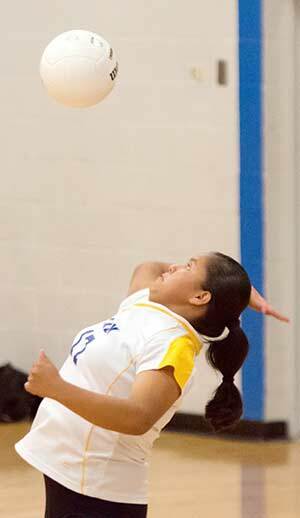 The Pirates cruised from there with junior Latisha Nastacio putting away four of her nine kills. In the third set, Six added three more service aces for a 17-3 lead before coasting to a 25-9 win. With the momentum, the Pirates put away Rough Rock in the fourth set thanks to the nine aces they had. Sophomore Melosa Padilla had six of those service winners and finished the game with seven. As a group the Pirates finished the contest with 30 aces with Six leading the way with 11.